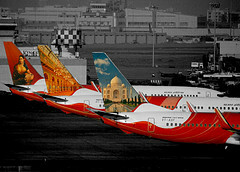 Airliners-India :: View topic - Two recent foodie reports from our own Ameya! Posted: Wed Aug 26, 2015 8:05 pm Post subject: Two recent foodie reports from our own Ameya! Without his permission, of course. I have been overawed after reading both. Superb pictures, and descriptions. I would not have been suprised had `thalitalia' been a pun from Ameya himself. The descriptions of the Dario's settings set the tone for a great experience. The greenery, right up to the call of the peacocks...blissful! Interesting concept, and great feedback on the jam-packed plates, and some pertinent take-home points about the presentations, and the taste. It was instructive to read more about Italian food. I have been once to Japan, yet not explored Japanese food as much as Ameya Sir has, in his trip to the Guppy pop-up. The concept itself was new for me: I have never come across such things in Delhi, although I rarely have your enthusiasm to go places, and that too, exotic and expensive ones! Ameya Sir: please put in links to your reviews prominently on this forum. Perhaps have a separate thread for all this? Sir, didn't you start a food thread already in this part of the forum?